California offers some of the best incentives in the country for solar, but SolarCity wasn't able to lower this writer's power bill. SunPower probably couldn't either. A few months ago, I called SolarCity (NASDAQ:SCTY.DL) and met with one of their salespeople. It was a fantastically simple and easy process, only involving a little work on my end to produce the past years' worth of power bills. However, to my surprise, SolarCity not only couldn't reduce my costs, but it was going to cost me more money to go solar. Not only that, I would be signing a 20-year contract, with no guarantees that it would ever reduce my power costs. Most likely it eventually would with my power company's history of price increases, but with no guarantees, my wife and I decided to stand pat for now. I may call around to some smaller, local installers, possibly one that offers solar panels from SunPower (NASDAQ:SPWR), but for now, I'm firmly in the camp of those that can't save any money and therefore doesn't see any incentive in switching. While I'm just one household, what if households like mine are the majority? Is all the expansion and growth in domestic residential solar coming to a screeching halt in the next few years? What's an investor to do? Honestly, I'm probably not typical of the market opportunity. Let's take a closer look. SolarCity has grown like wildfire over the past year and a half, and is projecting it will install double power capacity in 2014 versus what it installed last year. The remarkable thing about SolarCity's business model is how its contracts -- typically 20 years in length for residential customers -- offer such substantial long-term cash flow. Think about it this way: The company could stop selling new solar systems right now, and would keep generating revenue for 20 more years. How many businesses can you name that are in that situation? It's kind of amazing. It's such a great concept, that competitor SunPower has increased its stake in the solar leasing business in the U.S., with more than 20,000 customers and $220 million in financing available with Bank of America, in addition to the financial backing of majority shareholder Total SA (NYSE:TOT). Total also opens the door for SunPower to compete for utility-scale solar projects all over the world, like the 86 MW project SunPower is building in South Africa. But that's just part of the story for both SunPower and SolarCity. SolarCity has announced a number of partnerships with homebuilders in recent months, including a deal with 20 homebuilders in Oregon in January, and more recently with privately held Taylor Morrison in Arizona. This is an important business for SolarCity to enter, as homebuilders are largely competitors for solar business, operating solar installations as side businesses in addition to offering solar for new homes. SolarCity also has worked with Shea Homes in Arizona, and PSW Homes in Texas. As you can see from the table above, new home construction has averaged around 1.4 million, and largely correlates with household formations. As you know, we are still emerging from one of the worst recessions the country has ever experienced. One of the effects of this recession was a larger than usual number of young people remaining at home, or returning to home, versus moving out and starting their own household. 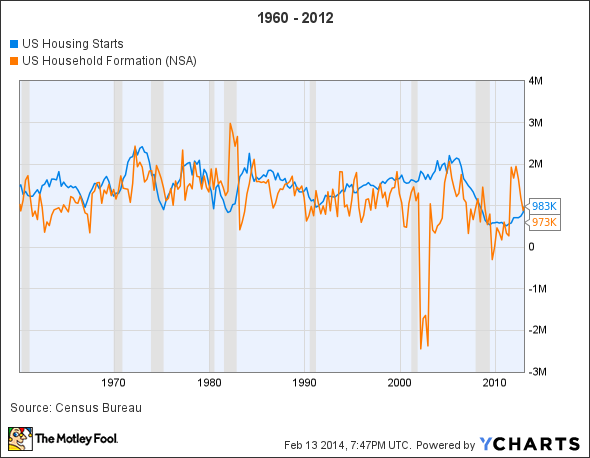 Household formations are finally beginning to rebound, though. The result will be housing starts returning to historical levels -- close to 50% above current construction -- and you can bet that a growing number of homebuyers will be interested in solar due to its cost and environmental benefits. SolarCity needs to be a part of this trend, and the coming months and years will likely lead to more partnerships with builders. SunPower is working with Berkshire Hathaway subsidiary Mid-American Energy on one of the largest solar projects in the U.S., which will generate a combined 579 MW upon completion. Its partnership with Total, as mentioned above, will lead to more of these opportunities, due to Total's reach and breadth of operations around the world. Total's 67% stake in SunPower is a boon for shareholders of both companies, due to the upside it offers Total, and the strong financial backing it gives SunPower. SolarCity is working with Hawaiian Electric to develop a solar energy project on O'ahu, the second of its kind from SolarCity on Hawaii, following an earlier project on Kaua'i. Combined, the two projects will generate close to 30 MW of energy and displace millions of gallons of fuel oil imported to the islands to generate power. While the size of these projects pales in comparison to some of the larger projects that SunPower has completed or is working on, SolarCity is ramping things up. The company also signed a partnership with Direct Energy in 2013. Direct Energy operates natural gas and electric utilities in 21 states, D.C., and most of Canada, serving more than six million customers. Partnerships like this will lead to growth for years to come. Simply put, my family's power consumption is insanely low. Our average power bill is about half the average for the area we live in, according to IEA data from 2012. While I hate admitting I'm below average in anything, as an investor in SolarCity, it's reassuring knowing that the vast majority of consumers are more likely to be able to find compelling value in switching to solar. And since SolarCity is my second largest stock holding, I think I'll hang onto my shares.